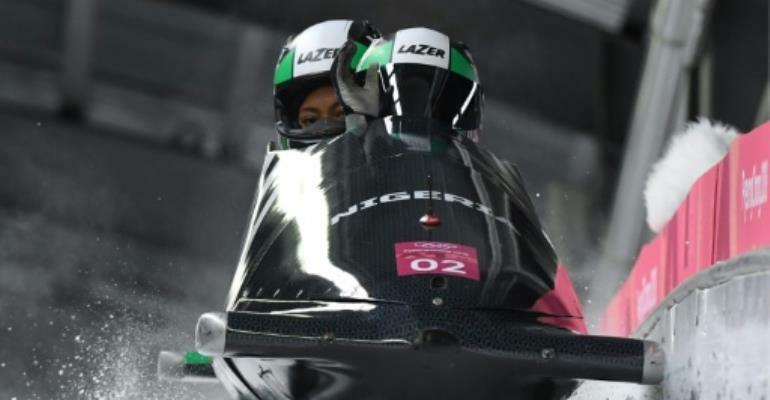 Nigeria's women's bobsleigh team finished with the wooden spoon Wednesday but left with their heads held high after an emotional Olympic debut in the crackpot winter pursuit. The plucky West Africans finished 20th in Pyeongchang, more than seven seconds behind gold medallists Germany in a sport where success and failure is measured in hundredths of a second. But try telling that to Nigerian driver Seun Adigun and partner Ngozi Onwumere after a landmark appearance, cheered on by their families and a vocal pocket of Nigerian fans. "It's quite amazing, I'm overwhelmed with joy and overwhelmed with the idea of knowing that history was made and we gave everything we had to do it," said Adigun, after bumping off several walls in a ragged final run. "This was just one of those days that you can't really describe," she added. "Full of all kinds of emotions -- full of relief, full of history." No African nation has won a winter medal but the Nigeria women plan to try again at the 2022 Beijing Olympics. "By God's grace you will see Nigeria in Beijing," said the Texas-based Adigun, after failing to improve on Tuesday's personal best. "We did everything we could. People are super-stoked back in Nigeria. We just pray all of our resilience does foster into some future athletes." Onwumere, who was a late replacement after Akuoma Omeoga fell ill overnight, added: "I can only express myself with tears, just because it's been a long road and finally we've completed it. I can only imagine how it is back home in Nigeria." The Germans won gold after Mariama Jamanka steered her partner Lisa Buckwitz their country's first success in the event since 2006. There was a gulf in class between Nigeria and Jamaica and the top three of Germany, the United States and Canada. But it mattered little to the tailenders. Thirty years after the Jamaican men's bobsleigh team took the world by storm at the 1988 Calgary Olympics, it was the turn of a hardy trio of women from the tiny Caribbean island to launch launching themselves down an icy chute at breakneck speeds. "Cool Runnings" the re-run ended Wednesday with Jamaica finishing 19th as they became the first women from their country to compete at the Winter Olympics. "The brakes broke actually so that didn't help on the way down," revealed driver Jazmine Fenlator-Victorian. "It wasn't necessarily the result we were looking for but we're pretty perseverant and resilient for a small island and we hope more of our islanders come out for winter sports."